Joost Elling, College of Agriculture and Natural Resources, and an Entrepreneurial Studies minor, began his entrepreneurial journey when he was just 13 years old. Joost discovered the stroopwafel while visiting his grandmother in her native Netherlands and set out on a mission to share the taste, and experience, of the great cookie with others in the United States. The stroopwafels left such an impression that the young entrepreneur started exploring how to bring the experience and taste to the United States. The Dutch cookie is not widely available outside of the Netherlands and its production is largely controlled by a handful of companies, but Joost was determined to find a way to share his discovery. Joost spent his high school years playing with and perfecting the recipe. That hard work and desire connected the young entrepreneur with a family friend business professor at Salisbury University who encouraged him to enter the Salisbury University Shore Hatchery competition. Joost continued his encouraging start by coming to the University of Delaware and discovering Horn Entrepreneurship. Joost entered and placed at Hen Hatch 2016, creating meaningful relationships with Horn Entrepreneurship faculty and gaining access to knowledge and resources. 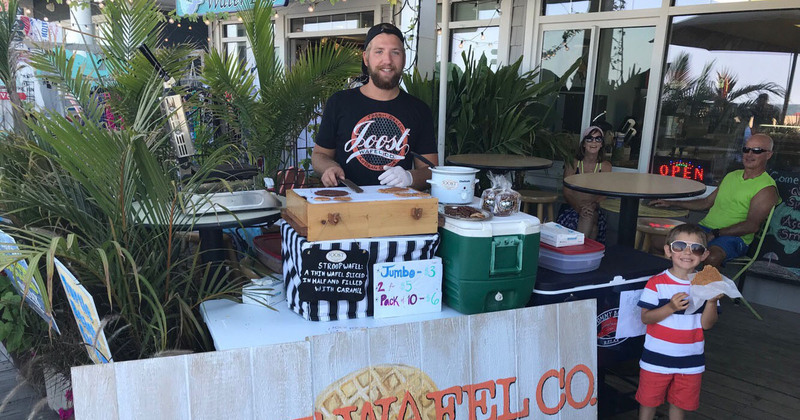 The stroopwafel master continued his desire to share the experience of the cookie by spending the summer making the authentic artisan Dutch cookie on the boardwalk of Bethany Beach. Joost added more into his cookie than just the taste, focusing on giving his customers more than just a great cookie. The cookie company founder credits the community around him for making it possible.